I hoard food. Kind of, sort of. When we’ve been relocated for Mr. P’s work, it has been a blessing and a curse. A blessing in that…is there anything more physically or emotionally grueling as moving? To have people come into your home, pack everything with skilled expertise, and move it to your new home is a luxury. I realize this and believe me, 4 moves since 2008 was still no walk in the park. Two years ago on my birthday, I remember unpacking our entire home, alone, in 90 degree heat. It was miserable. I’m the type of person who won’t tackle one room a day, but instead, go guns-a-blazin’ until it’s all done. Very much so to a fault. It’s bad enough that I didn’t purge anything on the other side of the move, but to put expired cans of soup in the pantry of my new home…I mean, what sense does that make? Fast forward to this weekend when there was nothing better to do other than clean out my pantry, and I find said soup…that expired in coughcough2009coughcough. EXPIRED in 2009, meaning it was probably purchased about 7 years ago. Clearly, that was an unnecessary purchase. I will never complain about the depth of my pantry shelves (having “staples” on hand for a food blogger basically means having one of everything in the grocery store…at all times), but my shelves are really DEEP. My short little arms can hardly reach the back and with poor lighting, it can become very questionable in the back of the pantry. Needless to say, I came across a can of artichoke hearts that were nearing their acceptable and recommended time on earth. I love artichokes…fresh, canned…love, love, love. And of course this recipe caught my eye. I mean, hello? What’s not to love? 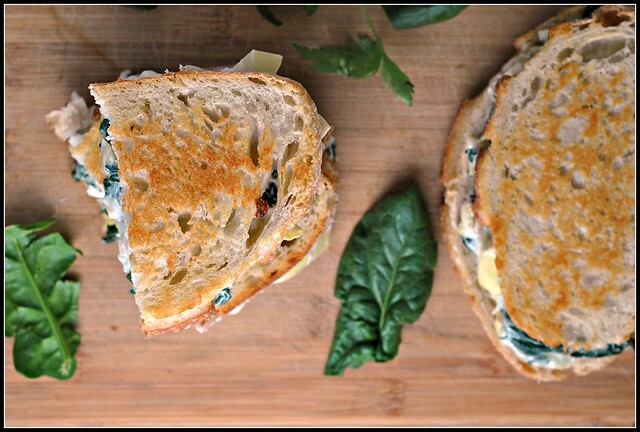 It’s like a healthy-ish, grown-up grilled cheese of sorts. Wish SPINACH! It’s brilliant. I added a bit of feta, plenty of cream cheese, and used fresh spinach sauteed to perfection. Comfort food just got real, real classy. The perfect balance of comfort food and good-for-you food. Creamy, decadent, and finger-licking good. Heat olive oil over medium heat in a large, nonstick skillet. Add the spinach and cook until wilted, stirring frequently, about 3-4 minutes. Transfer spinach to a mixing bowl; add artichokes, cream cheese, feta, and mozzarella; mix well. Preheat a griddle or nonstick skillet to medium-high heat. Spread ½ teaspoon butter onto one side of each of the slices of bread. 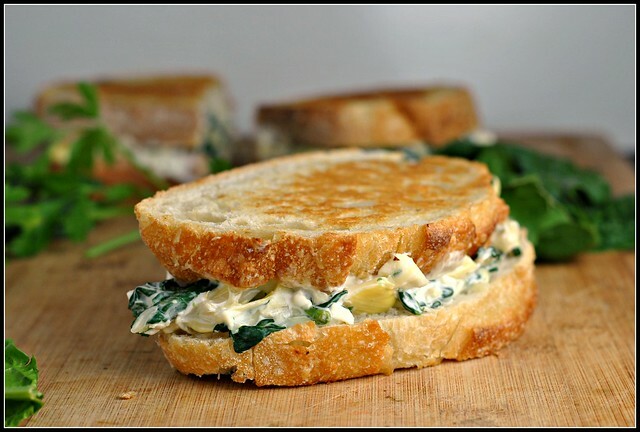 Distribute the spinach mixture evenly between each of 4 slices of bread, buttered side down. Top spinach mixture with a second slice of sourdough, buttered side up. Cook sandwiches 3-4 minutes per side or until golden brown. Remove from heat and allow to sit for 2-3 minutes before slicing in half. Serve warm. moving to where? anywhere near Dallas, Texas. Please say yes. My pantry isnt that big but im still look further deep who knows what i will find. Oh no, past moves. 🙂 No moving for a loooong while, I hope! 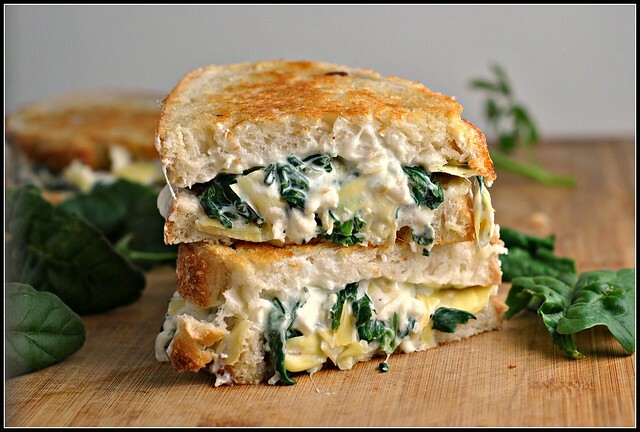 I love spinach and artichoke dip, I can’t imagine it on a sandwich. Yum!!! 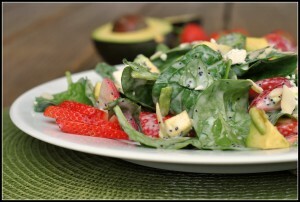 I love Tiegan’s site – she has some of the most unusual dishes on there! Love everything about this – and you had me at sourdough bread too! I love meatless Monday, but my boyfriend hates it! 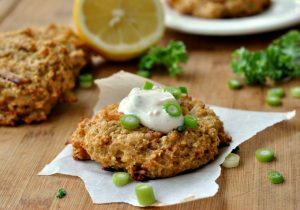 A perfect meatless Monday recipe, Nicole! I pinned this yesterday. Looks a.ma.zing. WANT. This sandwich looks like the perfect Meatless Monday meal, tho, the kind that makes you wonder why you ever needed meat. 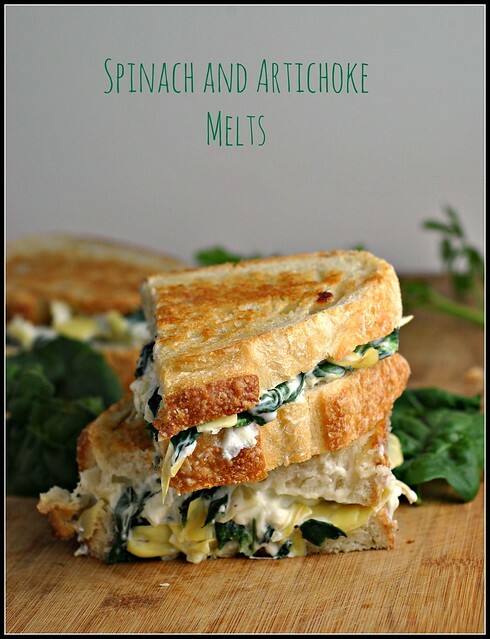 I love spinach and artichoke, and of course, grilled cheese is one of my top comfort foods. I think I’ll be eating this soon. Best of luck getting settled into the new place. We made these last weekend…they were SO SO good! What an awesome recipe!